Today street lights are harnessing the Solar energy to provide bright, well lit up, clean and cost effective street lighting alternative. Solar LED Street lights consumes less power and give more ground illuminance. 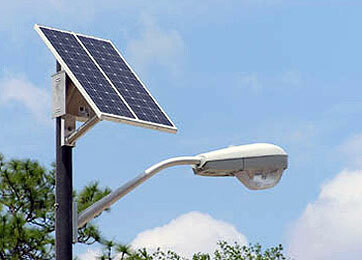 Solar street lights are ideal solution for lighting of campuses, roads, open spaces etc. CFL based street lights are also available. This system is designed for outdoor application in un-electrified remote rural areas. The system comes with battery storage backup sufficient to operate the light for 10-11 hours daily. Added to this the system is provided with automatic ON/OFF time switch for dusk to down operation and overcharge / deep discharge prevention cut-off with LED indicators. The PV modules have a service life of 25 years. Tubular Batteries provided with the solar street lighting system require lower maintenance; have longer life and give better performance as compared to pasted plate batteries used earlier. We also offer customization as per your requirements.